It's Flip-It Friday here on my blog, and I have a Thinking of You Z Fold card to share today. 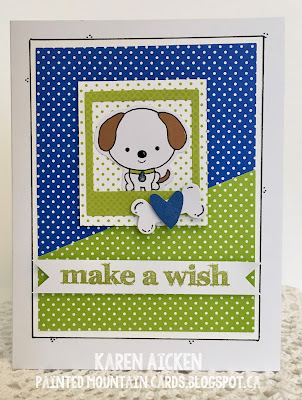 I used one of my favourite Pop it Ups dies - the Spiral Circle Pull Card, by Karen Burniston. This was actually a card I started well over a year ago. I had the card base and circle elements cut and then it sat in my 'In Progress' bin. I am trying to pick away at that bin and finish some of these cards. They don't do anybody any good just sitting there half done! I think I was unhappy (uninspired) by the monochromatic colour scheme I had going on - but once I added the black Washi tape and the black circles I was happier then to continue finishing the card. Today I'd like to share a cute little Double Z Fold card I made for a friend. I had just received the Foxy Friends Stamping' Up bundle so had to play with it right away. I added some glaze pen details to the fox's stamped face. Inside I added the spinner from Karen Burniston's Rectangle Pull Card to animate the little smile & heart word balloons. This was a fun card to make ... and I really like the spinner idea to add a little somethin' somethin' to the inside as it opens. Card size - 3-1/2 x 4"
I have a couple of quick Love Notes I made to send our Grandson's. It all started with the inside patterned paper. I was doing a sort & tidy-up and found this sheet of patterned paper. I'm pretty sure I've had it for over 10 years. Time to USE IT, wouldn't you say? 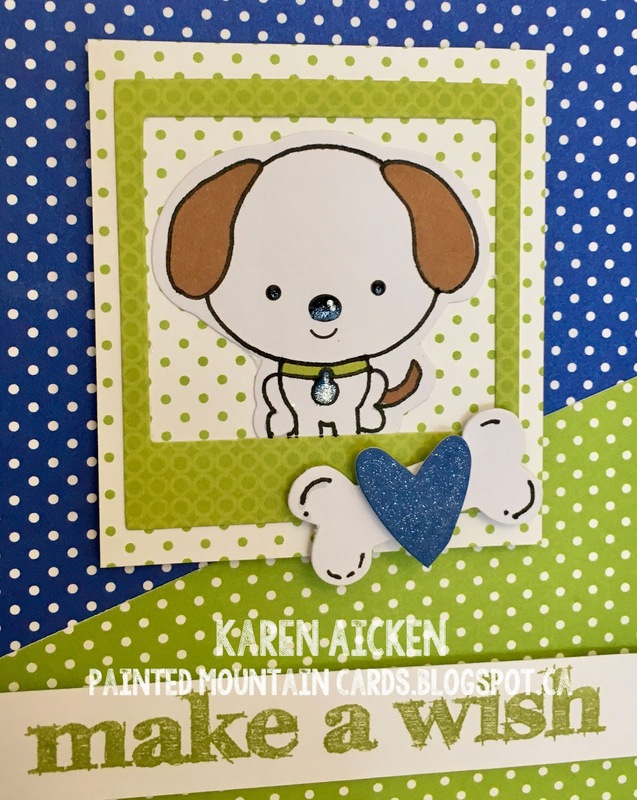 I used Karen Burniston's Twist Circle Pop-Up and kept the fronts nice and simple. The 'Hi' circles have the positive die cut on the second card, and the negative on the first. I used the bottom half of the patterned paper for this card. Sorry for the blurry photo though! I had these boyish printed embellishments in my stash, so used them along with Karen Burniston's Beach Edges to create the waves on the Pop-Up circle. The second card uses the top half of the patterned paper and an airplane printed embellishment. Here is the second card fully opened. These were so quick and easy to whip up - and I got to use up something from my stash. Win Win! Note - they are watermarked with my old blog, but I'm not redoing all the card photos with the new blog watermark. The card below was previously shown on my old blog, and made a couple of years ago. When I pulled it out to send out for Easter this year, I decided I could do more to it and created a Pop-Up inside the card. I didn't make my daughter and her family a Passover card this year, instead doing a Spring card. The Anita Frames Pop-Up by Karen Burniston worked just perfectly to finish off the inside of the card and make it a little more special. LOVE these sweet banner dies - getting lots of use out of them! Because the embellishments are 3-d, and I used some foam tape - this is a fairly bulky card. It's OK though as it will be hand delivered. There were a couple of Joset's new release at Elizabeth Craft Designs that I HAD to purchase as soon as they were available. The Diamond Background, Arrows and Feathers for starters. I used the Arrows and the Diamond Background for the card I'm sharing for Masculine Card Monday here on my blog. I used the Diamond Background as a stencil on some of the pieces and I was very happy with the soft look and subtle pattern. Inside is a Pop-Up, using Karen Burniston's Lorna Label Pop-Up. Colour was stippled onto the Diamond Background, then I trimmed it into pieces to use as embellishments on the card. The SW stamps I've had for YEARS - it was fun to pull them out again. Finally, here is the side view so you can see the Pop-Up a little better. While there is still lots of time before Father's Day, I have a number of Father's Day cards to make so wanted to get a head start on them. Card size - 4-3/4 x 6"
Get ready for a photo heavy post! I hope to be working on Christmas cards throughout the year, however these ones were made for last Christmas and just didn't get posted. That is why they have my old blog's watermark! Since these 3 cards are very similar I'm posting them together. Card #1 - the front of this one is nearly identical to Card #3. The main snowman on the front was fussy cut from the patterned paper and popped up with foam tape. The Lawn Fawn word dies got a lot of use for my holiday cards last year, and will for this year too. I have had this kraft Christmas paper stack for several years, and there are some sheets that the 12 x 12" patterns were just going to be tricky to use for cards. Finally I decided I could just have an entirely patterned card interior and trimmed the sheets to fit inside my top fold card. These cards are larger than the norm - they are 5 x 6". So I could use the entire pattern without having to figure out where to trim some of these taller images! I added a printed kraft banner, and a matted label as a place to add our greeting. Another fussy cut and popped up snowman is layered inside. Card #2 has a popped up cookie and those same word dies. The inside was done the same, with a 5" x 12" printed panel, a printed banner embellishment, a matted label and a fussy cut and popped up snowman. Card #3 - the front is done as for card #1. This image was so fun - and you can see how it would be hard to cut down to use on a card otherwise. The gifts were fussy cut from a separate scrap, and popped up with foam tape. It's Saturday so that means a new challenge at the Crazy 4 Challenges Blog. Our March 2017 Hostess is Frances Byrne, and our Guest Designer is Birgit Norton. You can see Birgit's Blog HERE. Here is Frances' challenge: Yesterday was my birthday, as most of you know one of my favorite this are Owls ... so for our challenge this week include an owl on your card. If you don’t have an owl no problem, any feathered creature will do. I didn't have my 'Poppy the Owl' dies handy, but this cute owl sticker was in my stash. I used it with a die cut branch for my challenge card today. This is a larger Flip-It card - a full 5 x 7" (folded). Since I'm going to need a bunch of Father's Day cards, I thought this would be a good start to them. Check out the C4C blog to see how the Crazies have been inspired by the challenge. We'd love to see your take on it, so be sure to stop by the Crazy 4 Challenges blog and link up your creations. If you are uploading to an online gallery, please use the keyword C4C378. My friend celebrates her birthday on St. Patrick's Day. I have sent her a couple of St. Patrick's Day/Birthday cards before so this year I just went with green. I made another Double Z Fold Card, and added some stamped lambs wearing party hats. The sun is one of the swirly scribble dies from Stampin' Up. The fence/hill dies were purchased before Karen Burniston came out with hers so I have hardly used this one. Since I'm trying to use older items on my projects, it seemed like a good time to use this set. The stamps are from an older stamp set and it's still fun! I was going to buy a new cute critter set from MFT but realized I already HAVE cute critter stamps - and lots of them. I added a white panel with a strip of green card stock on the back, and that is where I wrote my birthday greeting. Today I'd like to share the birthday card I made for my parents to give Zachary on his birthday. The dog printed embellishment was layered with other dies, and his eyes & nose are shiny because of a glaze pen. I love doing that - they catch the light when the card is turned. Diagonal cards backgrounds seem to be very popular these days - and the Blueprints #18 works perfectly for that technique. Because they are made for an A2 card though, I mounted the panels to a larger card blank and added some doodles around the outside. Card size - 5 x 6-1/2"
I enjoy making slider cards - and I don't make nearly enough of them. 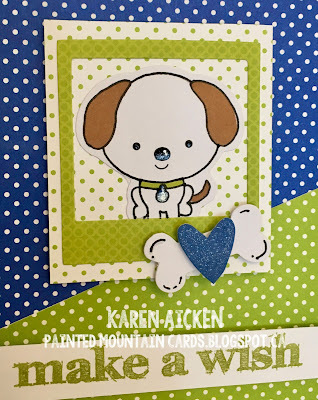 Today I have an Easter Slider card using Lucky the Bunny, the new Slider dies from Joset at ECD and Lawn Fawn stamps. I added a penny behind Lucky, so the weight of the penny allows for easy sliding ... Lucky slides along the track to reach the Easter Basket.